when i was in college, i saw the audrey hepburn / humphrey bogart classic movie “sabrina.” in the movie, sabrina, the poor yet beautiful daughter of a magnificently wealthy family’s chauffeur, is sent to a paris culinary school, where she is supposed to learn to be a domestic like her father. the problem is, she’s in terrible and tragic unrequited love with the family’s nee’r do well, yet adorably rakish second son, played by william holden. the point of the scene was to illustrate what hilariously pompous fools the french are, one of director billy wilder’s favorite pastimes. more importantly, it is to show that this character is way out of her depth in the kitchen, because all she can focus on is how love sick she is. what i took away from this was the absolute desire to be able to crack an egg just like that. one handed, swift, like a guillotine, “one, two, three, crack!” no mess, no muss, no fuss. i got really good at it. i could do two eggs at once. one in my right hand and one in my left. it was one of my silly personal pleasures. it was something i taught myself out of sheer fun, and delighted myself to no end to be able to do. i got really awesome at egg cracking. it was a thing of personal pride, my swift and precise eggsecution. 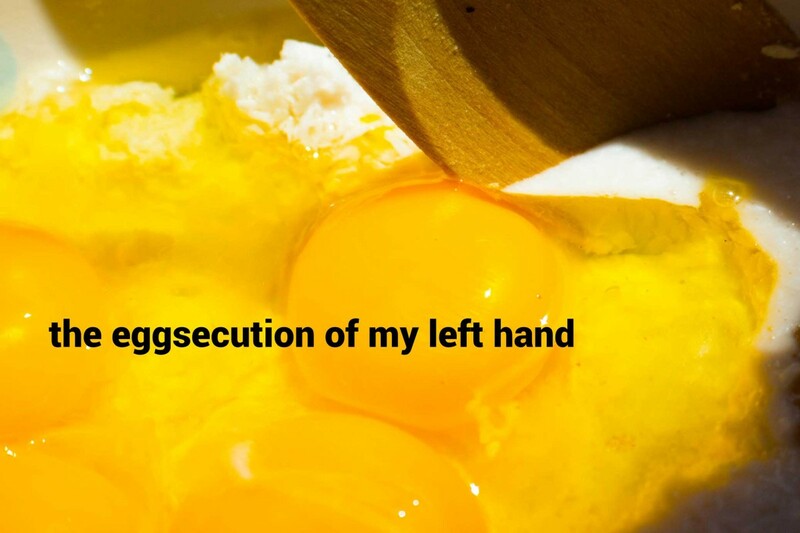 several months ago, i was baking in my kitchen, during a rough and painful arms / neck flair up, and i found that i totally couldn’t crack an egg like that anymore with either hand. i had to do it the way other people do it: one egg, two hands and even still, i was having to retrieve little pieces of shell from my bowl. i was totally devastated. it was something i so loved to do and to not be able was just heartbreaking. right then, i made a decision. this was not going to be a permanent situation for me, this was only a temporary setback. i would work hard and crack eggs, one after another until such time as i could do it with my right hand again perfectly. sometimes, i like to whip up an awesomely delicious (and gigantic) crustless quiche / frittata like-thing that requires a dozen eggs. i’ll usually make one on a sunday and it feeds us throughout the week. what better way to practice cracking and cracking and cracking eggs, and not be wasteful?! so, every week, for the last several months, i would stand there on sundays and just use my right hand and “one, two, three, crack! new egg” until i finally got it right. the day i did twelve perfect eggs in a row was a really good day. an exhausting day, but a really good one. i’m sure you’re thinking, “how exhausting is it to crack twelve eggs?” so exhausting! more exhausting than you can possibly imagine. it was exhausting because it took so much traumatic physical effort to make my hand do something so simple. it was a task that i had been doing effortlessly, almost daily, for nearly two decades. but now, i had to retrain my hands to do this rote motion. it was frustrating, agonizing, seriously painful but ultimately, very rewarding. once i remastered my right hand, i decided to give my left hand a try. 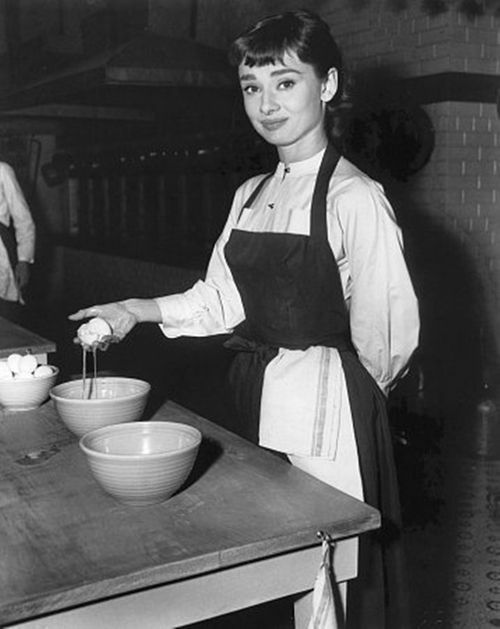 well, i looked like sabrina, standing there with a broken egg crushed in my hand, dripping egg all over me. it was really sort of pathetic. so again, i undertook the task of reteaching my left hand to do this simple motion. i’m not there yet. in fact, this morning, poor merman spit out a piece of shell from his breakfast scramble. i felt really terrible about it, for a brief moment, like i had let him down and more importantly, i had let myself down. but then i really thought about it. there is absolutely nothing i should feel badly about. i tried really hard this morning. i cracked six eggs with only my left hand. and yes, there was one tiny shell i missed. but i didn’t cry or scream or berate myself while i was cracking. i gave myself six tries to get it right and while i didn’t totally get it right yet, there’s always tomorrow. i’m willing to believe that there are many more breakfasts in my family’s future and at those meals, i will have endless opportunities to continue to crack eggs and hone this skill. while relearning how to do something you’ve already mastered is totally and utterly frustrating and largely demeaning, it’s not the worst thing in the world. the worst thing in the world would be if i just gave up and and never endeavored to try to recover, and say “that’s something i USED to do,” and be okay with it. that would be totally letting myself down. but there is absolutely no shame in trying to do something and not being perfect at it right away. i don’t get angry when lil’ flipper can’t remember what comes after g in the alphabet or after 8 in the numbers, because he’s still learning. to be angry and frustrated would be wrong. i encourage him and we keep working on it until he gets it right. i am no different. i might know what comes after g and 8, but my hands don’t remember how to crack an egg. i just have to keep at it, until they get it right. the thing about sabrina is that her transformation time in paris is relegated to a longish montage of silly scenes, beautifully written letters and “la vie en rose” as the background music. while it would be awesome if i could just pick four instances of me trying to crack an egg to a lovely french soundtrack, improving ever so slightly each time, real life isn’t a montage. and if it were, i would be missing out on the best part: the struggle, the many moments of hard work that add up to a total, and personal transformation. each time i crack an egg, i get a little better. and while “to show it all would take too long” as trey parker tells us, to not live it all is a tragic and terrible waste. so, no montage or fast forward for me. i’ll keep cracking my eggs, six at a time in the morning, 12 on sundays if we’re having that quiche-like frittata, until i am satisfied with my ability to do it. i’ll keep working with my left hand until i get it right, until those eggs basically fly from the carton and into the bowl in, what i consider is, a swift and perfect effort. the only thing stopping me from doing everything, is me. and i will no longer be my own adversary, maligning my efforts when i don’t succeed immediately. instead, i’ll be my favorite cheerleader – who happily eats a lot, a whole gigantic lot, of eggs. and that, for me, is an eggcelent victory.